Qiao Mu Cha Zhuan is compressed using tea leaves and buds picked in the high mountains of Menghai County during the early spring season (Ming Qian Cha). 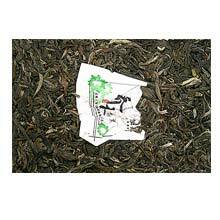 This brick tea is very suitable for further aging and will make a good Pu-erh after 2-3 years of aging. Although Haiwan Tea Factory is a fairly new company, it is owned and managed by the former manager of Menghai Tea Factory, Mr. Zhou Bing Liang. He is personally responsible for the quality assurance of Haiwan's product, thus you can expect very good quality Pu-erh from this company.